Renal abscess. Like acute pyelonephritis, one third of cases of renal abscess occur in a normal urinary tract; in the others it is a complication of a urologic abnormality. The clinical picture is that of severe pyelonephritis. In fact, it can be conceptualized as an unfavorably developing form of acute pyelonephritis that progresses from presuppurative to suppurative renal lesions, leading to liquefaction and formation of a walled-off cavity. The diagnosis of renal abscess is suspected when, despite adequate treatment of pyelonephritis (described in Fig. 7-34), the patient remains febrile after day 4. Here, necrotic renal tissue is visible close to the abscess wall. 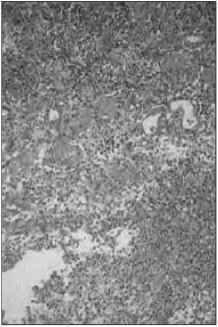 The tubules are destroyed, and the rest of the preparation shows innumerable polymorphonuclear leukocytes within purulent material.